When we went back east last year, we stayed a week at Steve's sister's house. We stayed in the room at the top of the staircase, and in that room, there was a bed with a series of blankets and quilts on it. There was this one quilt that felt quite delicate and beautiful. One night as we were lying there, I examined it in more detail. It was hand made. Just gorgeous work. These small tiny stitches. Steve and I talked about the quilt, and I later asked Wendy where she had gotten the quilt. She told me that Steve's Grandmother had made the quilt. 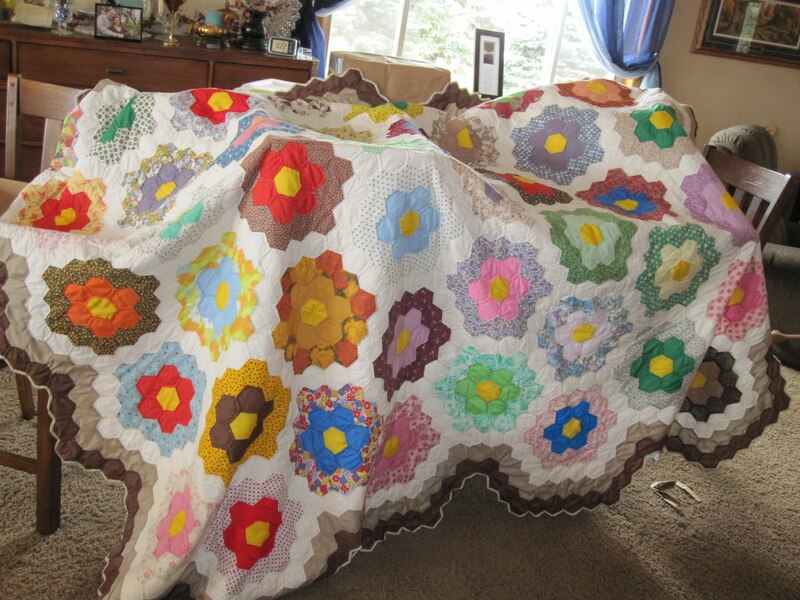 From then on, I just loved that quilt, and we were the lucky recipient of the quilt when we left the Midwest. It's now on our bed. I look at the detailed work on the quilt from time to time and it's served as my inspiration for the quilt work that I'm doing now. Isn't it lovely.